A demure Old European cut natural diamond rests snugly within a hexagonal faceted setting. 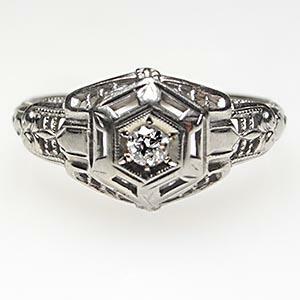 Ornate filigree graces the head and shoulders of this beautiful antique engagement ring fashioned out of 18k white gold. White gold's historical timeline is somewhat obscured by a longstanding misapplication of the term. Some jewelry writers report that white gold was first manufactured in the 1700s by alchemists Johann Friedrich Bottger and Ehrenfried Walther von Tschirnhaus in Germany. It is true that Mr. Bottger was an alchemist rumored to have discovered the secret substance believed to cure all disease and turn base metals into gold. However, his connection to the term "white gold" was secured in 1709 when, in conjunction with Mr. Tschirnhaus, he discovered the secret to manufacturing porcelain, Germany's "white gold". It does not appear that Mr. Bottger or Mr. von Tschirnhaus ever set out to manufacture the actual metal alloy we call white gold. The term "white gold" makes its next appearance in the 1800s, this time in reference to both cotton and ivory. When platinum deposits were discovered in the Ural Mountains in 1819, the original metallic "white gold" flooded the market. Platinum had been in circulation since ancient times, and as early as 1796, it was referred to as "white gold" or "small silver." However, it was not widely used in jewelry until after its discovery in the Russia's mountains. It has never been labeled as white gold in the jewelry industry. I'm sure we can all agree, despite these minor confusions, that the white gold used in this antique engagement ring is neither porcelain, cotton, ivory, nor platinum. It is, however, possible that it is made of the white gold compound consisting of gold, nickel, and zinc, patented in 1920 by the Belais brothers, who began experimenting with formulas for white gold as a substitute for platinum in 1887. It is also possible that it is made from the amalgam of gold, nickel, and palladium patented in 1915 by Karl Richter, a German chemist. After 1920, the Belais brothers held the patent for the only 18K formula on the market. Since this ring is made of 18K white gold, this could mean that it was made with the Belais alloy. If it is, it will bear the hallmark 'Belais 18K'. If it does not bear this mark, then it is possible it was made with Mr. Ricther's gold, or it might have been made sometime after the Belais' patent ran out (sometime in the 1930s). It is also possible that it was made sometime after the 1930s with someone else's formulation. Although today's 18K white gold formulas are based upon the pioneering work of these 20th-century chemists, they are of slightly different composition, granting them an even whiter, brighter color. White gold of 18K standard manufactured in the 21st century is now made of either 75% gold/2.23% Copper/ 5.47% Zinc/17.8% Nickel, or of 75% Gold/15% Silver/10% Titanium.